If your child suffers from inflammatory bowel disease, leaky gut syndrome, autism, ADHD, anxiety, or depression, chances are you’ve heard about the GAPS diet. Inspired by The Specific Carbohydrate Diet (SCD) and develop by Dr. Natasha Campbell-McBride, GAPS stands for Gut and Psychology Syndrome and is intended to remove gut-damaging foods that are difficult to digest and replace them with nutrient-dense foods in order to allow the intestinal lining to heal and seal. The GAPS diet is not intended to be a quick fix, and is a much more regimented protocol used to treat leaky gut, gut flora imbalances, and nutrient deficiencies, and if you do a quick search on Google, you’ll read some pretty powerful stories about the gut-brain connection and how the GAPS diet has helped children overcome symptoms of autism, ADD, allergies, and more. If you’re interested in pursuing the GAPS diet for yourself or your children, there are heaps of delicious GAPS recipes for kids online, but before we share our favorites, let’s dig a little deeper, shall we? The GAPS diet is based on the gut-brain connection, and is designed to heal and seal the gut lining, balance the immune system, and restore healthy bacteria within the gastrointestinal tract by focusing on diet, supplementation, and detoxification. There are several different stages of the diet, with new foods being introduced as you progress from one phase to the next. The diet eliminates dairy and sugar, allows minimal fruits and grains, and includes broths and probiotic foods to help the body heal. Who can benefit from the GAPS diet? The GAPS diet was designed to help those with food allergies and intolerances, behavioral and emotional challenges like autism, ADHD, anxiety, and depression, as well as other autoimmune disorders, but some would argue it can be beneficial to everyone when followed correctly. Does the GAPS diet work? The reviews are mixed. While some report their child was cured of all autism symptoms as a result of the GAPS diet, others question the validity of the diet, and while there shouldn’t be any harm trying some of the GAPS recipes for kids listed below, it’s important to do your own research before deciding if a full-fledged GAPS diet is right you and your family. Educate yourself on the benefits as well as the potential risks, talk to your family doctor, and enlist the help of a naturopath to ensure you fully understand the ins and outs of the GAPS diet before deciding how to proceed. What are the best GAPS recipes for kids? OMG, where do we start?! GAPS for kids can be challenging, especially if your little one is already a picky eater, but thanks to all of the parents who have already done the hard work for us, we’ve found over 50 GAPS recipes for kids that promise to be as delicious as they are healthy. Heal Your Gut, Change Your Life: Step by Step Guide to the GAPS Diet 50 Recipes by Andre ParkerIf your little one suffers from food allergies, behavioral and emotional challenges like autism, ADHD, anxiety, and depression, or another autoimmune disorder, and you are a believer in the gut-brain connection, the GAPS diet might be for you. It is said to help heal and seal the gut lining, balance the immune system, and restore healthy bacteria within the gastrointestinal tract, and with so many delicious GAPS recipes for kids available, what do you have to lose? Just be sure to do your research and talk to a professional to ensure the GAPS diet is safe for the specific needs of you and your family. Like all diets, it comes with risks and benefits, and only you can decide if it’s the right lifestyle change to make. 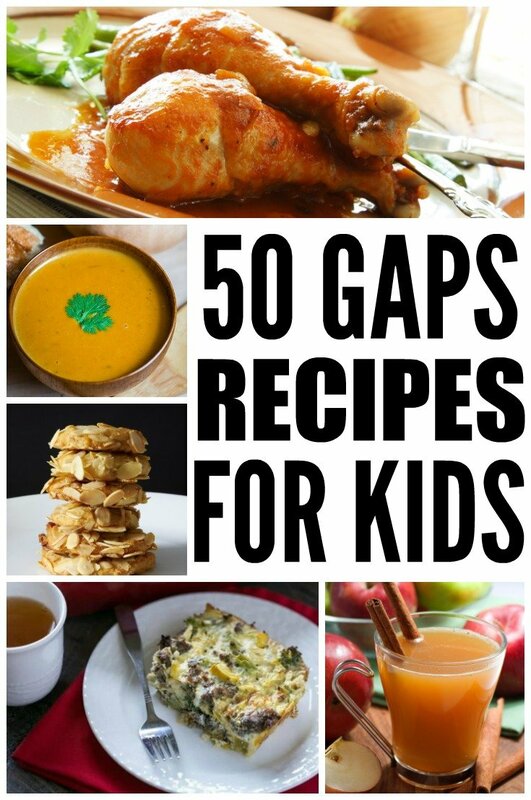 If you enjoyed this collection of GAPS recipes for kids, please share this post on Pinterest! And if you’re looking for more parenting tips and tricks, please follow our Parenting board where we share all kinds of fabulous advice!